When only the best travel cards will do. If you’re someone who loves to travel, getting a travel card is a good way to get you on that next vacation faster and cheaper. Whether it’s by earning points, using airline perks (like free baggage and companion vouchers) to save money, or just simply enjoying the premium travel benefits (such as lounge access and priority check in) ‒ travel credit cards have a lot to offer. And with lots of different types of travel cards – from specific airline or hotel cards, to cards that offer flexible travel rewards – there’s something here for everybody. flexible rewards, where you can use your points to redeem for travel booked in any way. Some flexible rewards cards also offer the ability to transfer to airline and hotel partners, plus the ability to redeem for cash. There’s a variety of different rewards available to suit everyone’s tastes. ...But it doesn’t stop there. That’s a lot of convenience and savings without having to spend anything (besides the annual fee, which these perks more than make up for). Plus, most of these cards have no foreign exchange fees to save you money when traveling outside the United States, and they usually have the biggest sign up bonuses to get you on your next vacation a little faster. While this all seems great, a travel credit card may not be for everyone. For starters, if you rarely travel, these cards may not be worth it. They generally have higher annual fees and you may find yourself paying for a lot of perks and points that you won’t be able to use. Airline programs can offer a gateway to free flights, but sometimes trying to find availability can be difficult or cost you a lot more miles if you don’t book in advance. And if you don’t have a lot of wiggle room with your dates, you might be hard pressed to find available flights that work for you. Plus, while flexible card points can be redeemed for cash back, your points lose value when redeemed this way. So, if any of this sounds like something you want to avoid, a cash back card might be an alternative to consider. So here it is. Our listing of the top travel credit cards available. 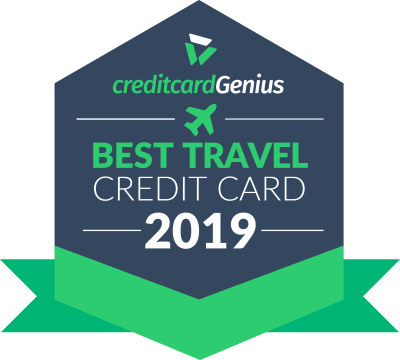 When something changes with these cards or a new card gets introduced, this list will be updated, so you’re always looking at our rankings of the best travel credit cards on the market today. ◊ The creditcardGenius algorithm calculates an estimated dollar value for all rewards and bonuses by using a typical point value a person can realistically achieve by redeeming their rewards in a reasonably optimized way. The "Welcome Bonus" is the dollar value obtained by combining of all one-time bonuses available to new cardholders within the first year. To qualify for the full bonus you may need to make purchases, meet minimum spending requirements, or complete special actions. Terms and conditions apply.